Although I was too late to actually WATCH (online) this London auction (1 PM GMT, 25 January 2017), I quickly could see what this exquisite little diary SOLD FOR, and listen to the rapid sale of other manuscripts and books. Jane Austen’s England.- [Hicks Beach (Henrietta, wife of Sir Michael Hicks, later Hicks Beach, of Netheravon, Wiltshire and Williamstrip Park, Coln St. Aldwyn, Gloucestershire, 1760-1837)] [Diary & Account Book], printed in red with manuscript insertions, 88pp. excluding blanks, most entries in pencil, a few in ink, pencil sketches of furniture on a few pp., list of novels at beginning and provisions at end, 1f. loose, browned, inner hinges weak, original roan, rubbed, ink date “1789” on upper cover, lacks head of spine, 2 tears on spine, 12mo, 1789. ⁂ Includes numerous references to visits and dinners, including to the Chute family of The Vyne (a country house near Basingstoke), and their relatives, the Bramstones of Oakley Hall, Basingstoke, both families known to the Austen and Hicks Beach families. “Friday 6th February 1789 Mr W Chute came to Dinner…”; “Sunday 13 September 1789 went to the Vine to Dinner… Mr. T. Chute”. Also includes amounts lost and won at cards, payment for wages, items bought, money received from Mr. Hicks and paid to their son, Michael. Other names including, the Pettat family (Rev. C.R. Pettat became Rector of Ashe), Polhill, Musgrave etc. Jane Austen was 14 in 1789 when this diary was compiled. “The Beach and Wither families were well known, and frequently discussed by the Austens at Steventon. When Michael and Henrietta Maria Hicks Beach… lost one of their babies, in 1796, Jane Austen was well enough acquainted with their romantic story to confide to her sister Cassandra, ‘I am sorry for the Beaches’ loss of their little girl, especially as it is the one so like me’ (9 January 1796).” – Chris Viveash. Sydney Smith, Jane Austen, and Henry Tilney, Persuasions: The Jane Austen Journal, Vol. 24, 2002. I suspect it was once owned by Chris Viveash. OH! how I wish I had gotten online in time to hear the auctioneer say, “Lots of interest in this lot”, (as he undoubtedly did!). The auctioneer goes through lots FAST, yet always the fair warning, which gives just enough time to put in a new bid, IF YOUR WALLET IS THICK ENOUGH. The successful buyer must indeed have had deep pockets. The estimate was £400-600. The selling price (which may NOT include the seller’s premium): £1,100! Few will have heard of the Hicks Beach family – but attach the name “Jane Austen” and it was guaranteed to sell. Did it go to an internet buyer? phone buyer? or “In the Room” — would LOVE to know where it will be heading to, after today. Would be WONDERFUL to learn that the Hampshire Record Office (Winchester), which has some Hicks Beach materials, or The Vyne – which gets mentions in the diary – was a purchaser. Will we ever learn its fate?? ESTIMATES are in the tens of thousands. Good news for the family; but what institution, even, can afford, item after item, to pay such prices. I, personally, wonder if the archive – together for over 200 years – will be fractured beyond repair of ever being reunited. Conversely, now that they’ve seen the light of day, will the precious letters and other artifacts be swooped upon by deep-pocketed collectors – bringing up the possibility that these “national treasures” might depart the U.S.
Two Teens readers will recall the embargo the U.K. placed on Kelly Clarkson’s purchase (at auction) of Jane Austen’s ring. Will the U.S. be faced with anything similar (and not over just one item)?? The photo, above, shows TWO of the gut-wrenching articles up for sale: a letter of Eliza Hamilton, and a lock of Alexander Hamilton’s hair. You can look through the online Catalogue, Alexander Hamilton: an Important Family Archive of Letters and Manuscripts, in order to draw up your own lists of “wouldn’t that be nice to have”. I know what I’d love to sit and read: Letters to, from, or about the Schuyler Sisters. They fascinate me. For instance: Lot 1006, Autograph Hamilton letter to Peggy Schuyler, confessing his love for her sister Eliza Schuyler: estimate $15,000-20,000. Or, the five-page love letter (Lot 1007) from Alexander Hamilton to his “dearest girl” Eliza Schuyler, the earliest surviving letter of his to her: estimate $40,000-$60,000. Even with the monies the musical Hamilton has brought to composer/star Lin-Manuel Miranda and historian Ron Chernow, even a handful of items could break their banks: Either of them might like General George Washington’s letter appointing Hamilton as his aid-de-camp (Lot 1004). Estimates being up to a cool quarter-of-a-million-dollars means the price could be even higher. See this “Admiral Lord Nelson’s Bachelor Teapot“, the estimates were £8,000-12,000 – it sold for £56,250! If your family archive (mine has NONE, I must confess) could fetch money – whether “enough” or “millions”: Would you seek to sell? I don’t think I could do it. Good thing, then, that I don’t have to worry about it…. LOT 1040 – a group of 17 letters from Philip Schuyler to his son-in-law Alexander Hamilton. Estimate was $30,000 to $50,000. Sold for (with buyer’s premium) $118,750. Y-o-w-! more than twice the high estimate. The New York Times offered readers a couple of affecting portraits of potential buyers: an 11-year-old from Manhattan, Zack Pelosky, had bid on a “low-ticket item,” which ultimately went to a phone bidder for $1,500. 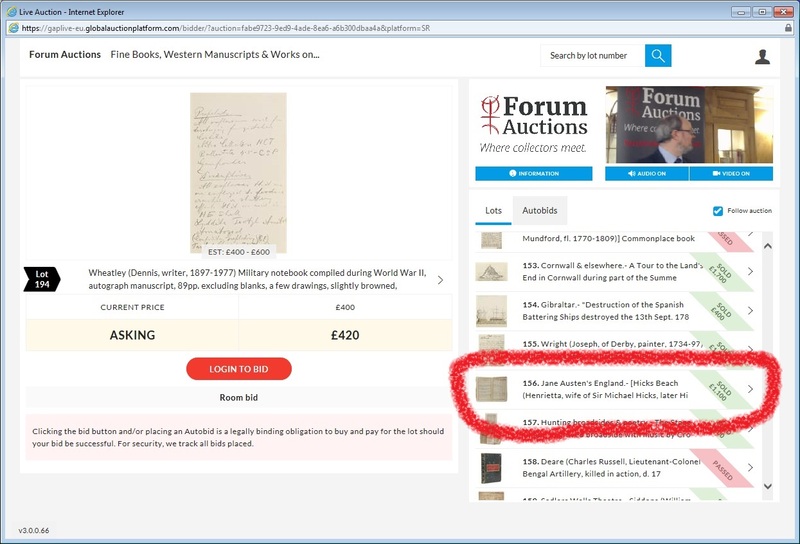 Joanne Freeman, “a Hamilton expert at Yale,” who has been studying duel culture, bid on a fragment of a Hamilton 1795 will – and was likewise outbid. Or, as author Jennifer Scheussler’s Hamilton-reference quoted: the Professor was “outgunned”. Imagine! a writer and historian hopeful of a piece reminiscent of the very person studied… only to have the hopes dashed. From the article, it was obvious that the auctioneer had been on young Zack’s side, too. An Angelica Church (née Angelica Schuyler) letter went for $50,000 – “more than ten times the estimate”. The disparity argued away by, “there’s no way that someone who saw the show [Hamilton] made that estimate”. A note for people like me who wished the archive had gone wholesale to a repository: The Gilder Lehrman Institute of American History evidently came out as a heavy-hitter (or, should I say heavy-bidder). CNN’s report on the auction mentions the sale of the lock of Hamilton’s hair: $37,500. Keep in mind that hair, an exceptionally personal item, was exceptionally popular as a remembrance – of the living as well as the dead – in this period. I see MANY locks of hair in my own research – though I do wish I’d come across some of the Mourning Jewelry Smith & Gosling letters mention! As someone who is working to put back together the disparate sides of a voluminous correspondence, a pang enters my heart when I read a quote from Selby Kiffer of Sotheby’s: “What is so unusual about this is it’s a cohesive integral whole that’s survived since the 18th century. The pieces interrelate and inform each other. It’s rare to have correspondence back and forth.” Only the future – and further writers on Hamilton and family – will tell us where all these items ended up. Fingers crossed that access to the items (especially letters!) whether opened or closed before are open to examination from now on. Manhattan fans evidently did take the opportunity to SEE the archive, during the week-long exhibition prior to the auction. That last brought up a thought that hadn’t before entered my brain: who purchased with the intent of RE-SELLING and making MORE money? I say that because of one item in the Smith & Gosling universe. I have blogged about miniatures being sold several times, including a link to the brother of Susan Mackworth Smith (Emma Austen’s great aunt): Vice-Admiral Bulkley Praed, sold at Bonhams in 2011 for £1250. I remember being SHOCKED seeing it BACK up for sale at like twice the price almost immediately. Wouldn’t Joanne Freeman or Zack Pelosky lose heart if they saw their pieces back on the market – or, on eBay – like some scalped theater ticket. It dawned on me last week what _I_ would have done, had I been a Hamilton descendant: I would have opened a museum, where those in love with the musical, history, Hamilton – the Schuyler Sisters – or even Aaron Burr could have paid to spend a little time in the presence of these people. Here’s hoping for public access, and that this is not the “end” of the Hamilton Papers’ Saga. Gotta wonder: did Chernow or Miranda come away with any souvenirs?